What could possibly be more bleak than for a child to be homeless, cold and hungry over the holidays? It has become something of a holiday season tradition at NESCA to designate a children's charity as the beneficiary of donations by our staff. This year, we will be supporting Boston-based Horizons for Homeless Children. And we would like to encourage you to join us! Horizon's 2014 wish list is below, or you can download it HERE as a PDF. 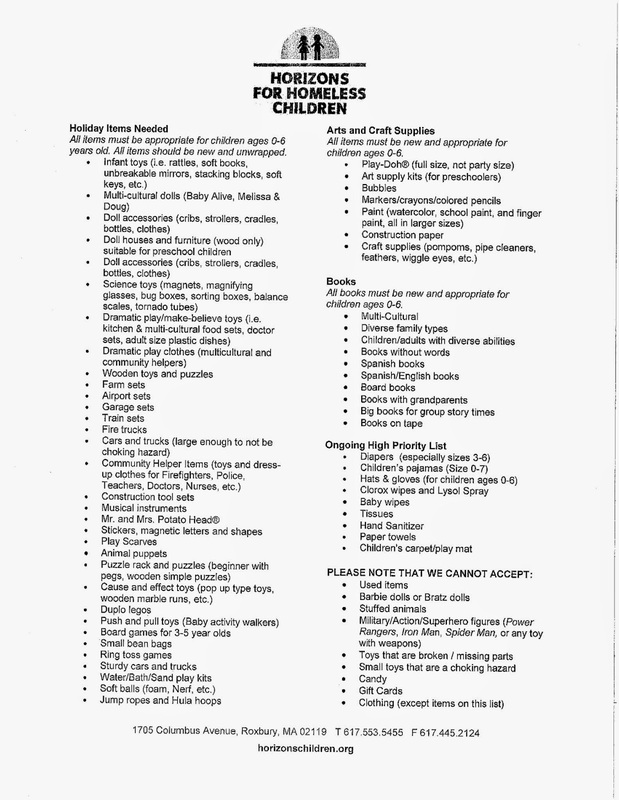 Please note that all items must be new, unwrapped and suitable for children 0-6 years old. Beyond toys, books and arts and crafts supplies, Horizons has a pressing need for staple items such as hats, gloves, cleaning supplies, baby wipes and diapers. If you're willing and able to help, please bring your contributions with you to NESCA when you come in for your appointments. No appointment? Swing by with your gift and say hello! We'll arrange for delivery. The deadline is Friday, December 12th. Season's greetings and many thanks for your support! "One out of every 30 children..."
“One out of every 30 children in the U.S. experienced homelessness last year. That makes nearly 2.5 million children who, in 2013, lived in shelters, on the streets, in cars, on campgrounds or doubled up with other families in tight quarters, often moving from one temporary solution to another, according to “America’s Youngest Outcasts,” a report published Monday by the National Center on Family Homelessness at the American Institutes for Research.